It's been a while since we looked at console sales in Japan, but there are two reasons to do so now. First, thanks to Matt Matthews, I found a source for weekly Japanese video game hardware sales back to 2000 (which gives me several additional years of data to work with). Second, I've been thinking for a while about how I could show sales trends without the holiday spikes, or rather, incorporating that data but taking a longer-term view of what's happening. After thinking about this for several weeks, I thought of an approach (and it was quite stupid that I didn't think about it after fifteen minutes): use twelve-month moving averages. Moving averages are commonly used when analyzing the stock market, and using a twelve-month moving average would allow us to have a new perspective on existing data. Plus, there are no seasonal spikes, because every data point includes the holiday periods. I was hoping that using this approach would make it easier for us to spot trends, so let's take a look. Oh, and please keep in mind that since these are twelve-month moving averages, there are no data points for a system until it's completed one year of sales. Then, there's one data point a month (that incorporates the previous twelve months) from there on out. 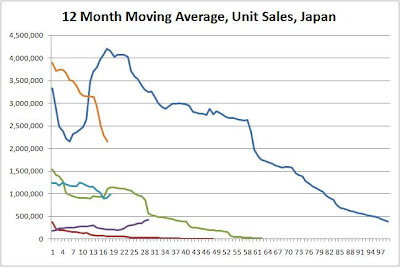 It should come as no surprise that hardware sales in Japan are highly cylical, and this graph demonstrates that clearly. What surprised me, though, is that the trough to peak (in terms of a 12-month moving average of unit sales) for the last two generations were almost identical in terms of time (14 months for the last generation, 15 for the current). 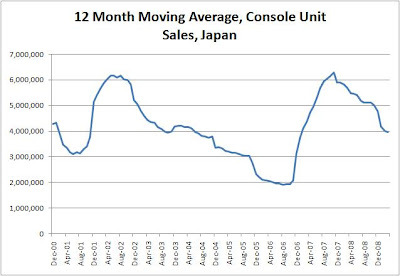 Also, there's been quite a bit of commentary about the steep decline in console sales in Japan in 2008, but this kind of decline is apparently nothing new. 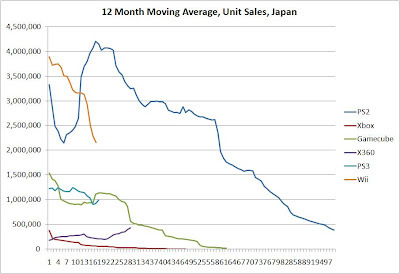 To be fair, part of the concern in Japan is over slowing sales of handhelds as well (which is something I don't cover), but on the face of that graph, Japan loves new hardware and gets bored quickly. Until I saw this graph, it hadn't even crossed my mind that we might have already peaked in hardware sales for this generation in Japan, but it certainly looks that way. And if peak to trough is as similar as trough to peak, the future is looking a bit ugly, because we would be looking at a four-year decline (as well as a 50% decline from current levels). That's number of months at the bottom, by the way. "1" is the first twelve months of sales of a new console, and each succeeding data point moves forward a month (calculating a twelve-month moving average going forward). Using twelve-month moving averages, there are several interesting stories that I hadn't seen before. If you had told me that the only consoles with higher 12-month moving sales averages three years after launch were the PS2--and the Xbox 360--I would have laughed. I also would have laughed at realizing that at this point in their lifespans, the twelve-month moving average of 360 sales in Japan is approximately equal to the Gamecube (and look like they'll cross shortly). I've said this before, that I think Microsoft has done quite well this generation in Japan compared to expectations (I know, that's a low bar), but these graphs demonstrate it clearly. The Wii's decline is also shocking. I knew that sales were down substantially, but on a twelve-month basis, those numbers are alarming. Yes, the first year sales were absolutely huge, but it's still a freefall. The PS3? Well, if you want to know what Sony was hoping for, just look at the PS2 graph. Then move down three million units a year and find the PS3. I'm guessing (and expecting) that at no point in the PS3's lifespan will these graphs ever cross. I doubt they'll ever even be close. So if Sony stops competing with their own ghosts, what are its prospects? It's true that the PS3 has outsold the Wii for the first three months of 2009, which is quite astounding, but unfortunately for Sony, their sales are actually lower than for the first three months of 2008. One positive note, though, is that sales seem to be picking up, as opposed to 2008, when they were, by March, plummeting. Still, quite a bit of Sony's "rebound" in Japan seems to have more to do with Nintendo falling off a ten-story building and passing them on the way down than anything else. Next week we'll take a look at U.S. data using the same methods.